We enjoyed these yummy biscuits for breakfast last Sunday, made in mini form. They were delicious, especially with the pistachio eggplant spread. They make a delicious savory breakfast or brunch or for any time. Combine the flours, salt and baking powder in a bowl. Add the cold margarine, cut in pieces, rub he margarine in until the mixture has the texture of coarse sand. Stir in the chopped walnuts and herbs, then add the soy milk and stir with a fork until the mixture just holds together. Put the dough out on a lightly floured board and very gently knead it just a few turns, just until it can be rolled out. The less you work the dough, the more tender the biscuits will be. Roll the dough out 3/4″ thick, and cut out biscuits with a cutter. Place the biscuits on a parchment covered baking sheet, and bake them at 425 F / 218 C for about 12 to 13 minutes, or until puffed and golden brown. Makes about 10 to 12 biscuits. 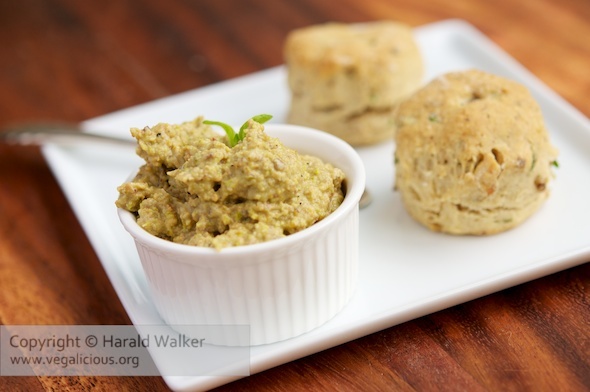 This makes a very tasty eggplant spread that is a nice alternative for Baba Ganoush. Prick the skin of the eggplant all over with a fork. Place the eggplant in an oven proof baking dish with a bit of oil, so that it does not stick. Bake the eggplant at 350 F / 177 C until it becomes soft, about 20-40 minutes. While the eggplant is baking, shell the pistachios. When the eggplant has softened, remove from the oven. When it can be handled without burning your fingers, remove the skin and place the pulp in a bowl. Add the shelled pistachios and puree to a smooth mixture. Add the lemon pepper, salt and garlic, onion and Cajun spices. Season to taste with additional spices as desired. Posted by Chris Walker on September 17, 2010 in Breads and Muffins, Breakfast, Pistachio, Spreads and Dips, Walnut, Zucchini.